Bring divine harmony to any room with this beautiful salt crystal lamp. Its therapeutic glow of orange hues infuses a natural calm bringing the mind and body to a gradual sense of tranquility and well being. 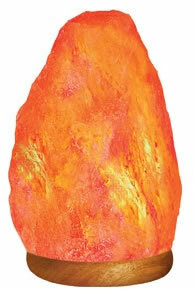 Experience it for yourself, but wait….this is not the only reason to have a salt crystal lamp! When the lamp is lit, it emits negative ions that fight against positively charged particles that cause us to feel stuffy and sluggish. This lamp is made of salt crystals, from deep within the Himalayan Mountains, home to the world's purest and most colorful salt. It is hand carved to preserve its natural beauty and attached to a hardwood base. It is almost maintenance free and is very easy to clean. Just wipe off the outside surface with a damp sponge and dry off with a paper towel. You can change the color of the bulb to give a different hue to the lighting area. You can keep the lamp lit for as long as you like and the longer you keep it on, the better the emission of negative ions. 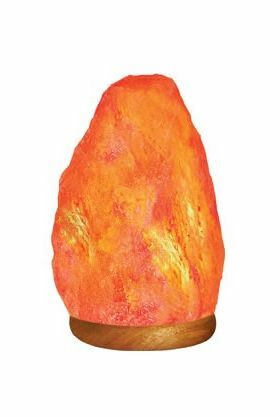 Place this lamp in your child's room and watch him fall asleep with gentle ease or put it next to your computer and feel your stress dissipate as the negative ions counteract the electromagnetic fields bouncing off the computer. You can put it in your TV room, or your office. It really doesn't matter which room you choose, it is totally up to you where you want to place this unique gift of nature.